As a result, the A99 II displays a notable improvement in its low-light performance compared to the original A99, achieving a higher low-light ISO score of 2317 ISO. The A99 II’s headline Landscape and Portrait scores haven’t progressed, but it still offers very solid results at base ISO and improved performance in the medium-to-high ISO sensitivities for color and dynamic range, thanks to that BSI sensor. This makes the Sony SLT A99 II a great choice for photographers after a high-resolution camera with good low-light performance. Another Sony sensor to crash through the 90-point barrier, the Sony SLT A99 II offers exceptional overall image quality with excellent headline scores in all categories. Boasting a super high-resolution 42Mp sensor, together with very good scores for color depth and dynamic range at the lower ISO sensitivities, the A99 II is a good choice for commercial landscape, portrait, editorial, or advertising photographers shooting high-quality or large-scale print commissions. Press, event, and sports photographers will appreciate the switch to a BSI sensor, too, with its notable improvement in low-light performance compared to the A99 — which is no mean feat, considering the significant jump in resolution. That improvement in low-light performance has elevated the A99 II’s overall score above that of its predecessor, the A99, despite a slight regression in its headline Portrait and Landscape scores. 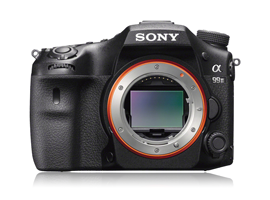 The A99 II remains slightly behind the 42Mp Sony A7R II mirrorless hybrid, however, which scores 98 points overall, and offers around half a stop better image quality in all categories at base ISO compared to the A99 II. Compared to the high-resolution, full-frame, semi-pro DSLR competition, the Sony SLT A99 II ranks just behind the 36Mp Nikon D810 and Pentax K-1, which offer over a stop better dynamic range at base ISO and slightly improved color depth and low-light ISO performance, too. The A99 II is marginally ahead of Canon’s 50Mp 5DS and 5DS R cameras, however, thanks to around one stop better dynamic range at base ISO, with comparable color depth and low-light ISO results. While the Sony A99, A99 II and A7R II all offer exceptional dynamic range over 13 Ev at base ISO, and great results up to ISO 400, we see that the BSI sensors in the A7R II and A99 II produce better results at the higher ISO sensitivities. The A7R II remains slightly ahead of the A99 II at all ISO settings, but the A99 II offers around one stop better Landscape scores from ISO 800 when compared to the A99, with both the A99 II and A7R II offering good dynamic range of around 10 EV up to ISO 6400. Comparing the A99 II’s landscape scores against the Nikon D810 and Pentax K-1, the trend is the same, with the 36Mp sensor’s one-stop dynamic range advantage at base ISO reduced as ISO sensitivity is increased. 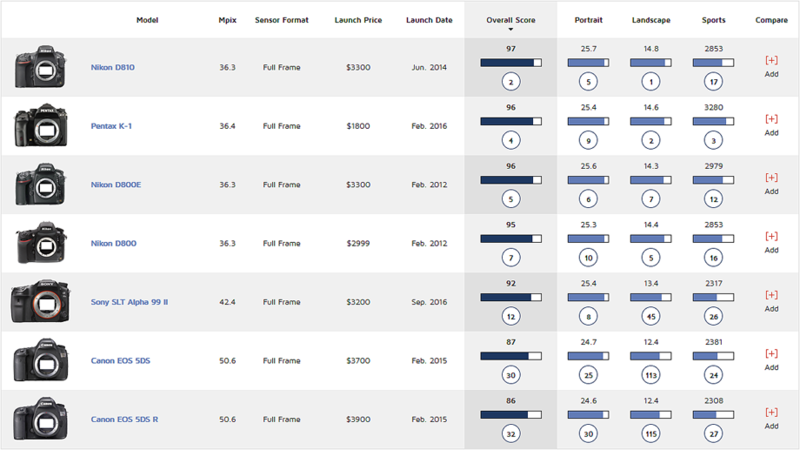 All three sensors achieve very similar landscape scores from ISO 800 on. Comparing landscape scores on the A99 II against the Canon 5DS and 5DS R 50Mp sensors, the reverse is true, as the A99 II’s one-stop advantage at base ISO is notably reduced by ISO 200. All three sensors offer much more comparable dynamic range results from then on, despite the fact the A99 II remains fractionally ahead at all ISO sensitivities. For color depth, results between the A99 II and its predecessor the A99 are pretty close, with the A99 II pulling away slightly at the higher ISO sensitivities, although the difference isn’t as pronounced as with dynamic range. The Sony A7R II offers better color at all sensitivities, offering over a stop better portrait scores in the middle of the range, recording the same 20.5-bit color depth at ISO 3200 as the A99 II at ISO 1600. Portrait scores against the 36Mp Nikon D810 and Pentax K-1, as well as against the 50Mp Canon 5DS and 5DS R, are much more aligned, however, and we can essentially say they offer the same color depth as the A99 II throughout the ISO range. Comparing low-light performance using the Signal-to-Noise (SNR 18%) charts, there’s a very similar pattern to both cameras’ color depth results, with the A99 II slightly behind the A7R II, but much closer to the Nikon, Pentax, and Canon DSLR competition. Despite this slight advantage for the A7R II, the results are pretty close, and all of these super high-resolution models offer excellent low-light performance with SNR above 38 dB up to ISO 400, and very good results of around 32 dB up to ISO 3200. The Sony SLT A99 II gives landscape, architectural, advertising or magazine photographers desiring plenty of pixels for large-scale or high-quality prints another camera to consider. Although its $3198 price tag puts it squarely in the professional or very serious enthusiast category, it’s no more expensive than the 42Mp, $3198 Sony A7R II, and actually cheaper than the 50Mp, $3699 Canon 5DS. The switch to a 42Mp BSI sensor delivers some excellent image quality, with great results both at base ISO and towards the middle of the sensitivity range. Although better color depth and dynamic range image quality at base ISO is available on the Sony A7R II, photographers after a larger DSLR style body might prefer the A99 II’s design and handling over the mirrorless A7R II, and its overall image quality isn’t far behind. What’s more, the A99 II’s fast 12fps burst shooting with autofocus tracking puts it on par with high-end professional sports cameras, and its BSI sensor technology ensures good low-light performance despite its massive 42Mp resolution. The SLT fixed translucent mirror and resulting EVF might be a drawback for some photographers used to an optical viewfinder, but this brings other advantages for some subjects and in some situations. With such additional features as a hybrid autofocus system, a 5-axis sensor shift image stabilization, a BIONZ X image processor, as well as internal UHD 4K-video and HD capture at 120fps for slow motion effects, the Sony SLT A99 II offers good all-round specifications. Add to that its 42Mp resolution with exceptional image quality and you get an awful lot of camera for your mone,y making the Sony SLT A99 II a serious contender for high-resolution shooting. For greater insight into the image quality capabilities of the Sony SLT A99 II’s main competitors, please refer to our Sony A7R II, Canon 5DS and 5DS R, Pentax K-1 and Nikon D810 reviews.